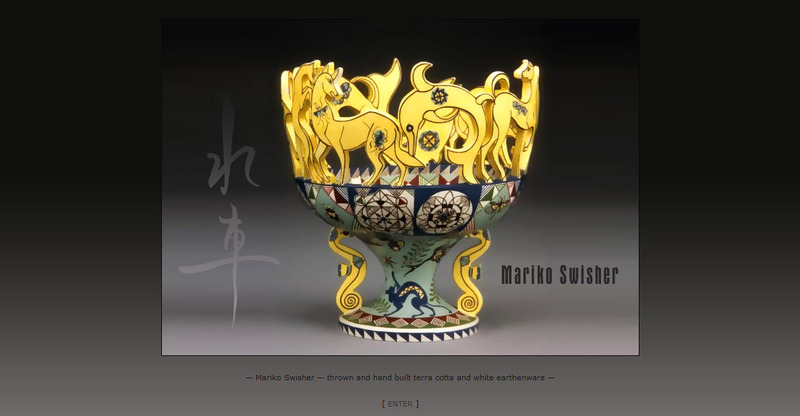 Mariko Swisher is a native of Sendai, Japan. She is a licensed calligrapher who emigrated to the United States 20 years ago. She began her study of ceramics in Japan. She is widely exhibited and since moving to New York City, she has studied with such greats as Akio Takamori and Peter Volkous just to name a few. 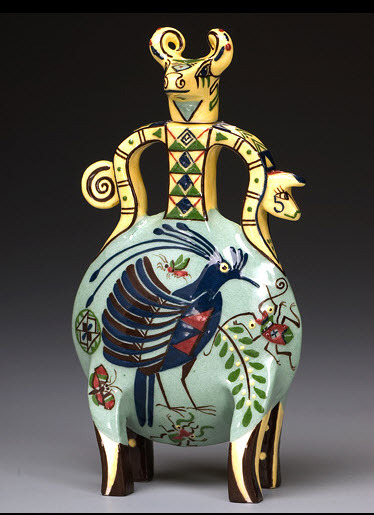 David Revere McFadden, chief curator at the Museum of Art and Design in New York City, thinks Mariko's work is inspired by ethnic and folk pottery and feels her work functions on both practical and cultural levels. At first glance, you wonder if Mariko's work was unearthed from the Tang Dynasty! 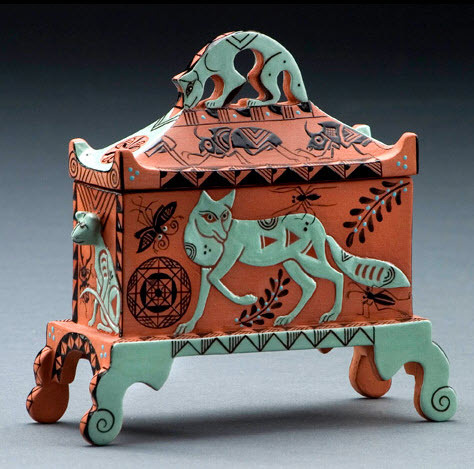 Upon closer inspection, you see how her artistic vision marries the past and the present. Her calligraphy skills and interest in ceramic design evoke a rare an beautiful combination. I feel that she bridges the gap between decorative and fine art. I also feel her pieces have a timeless quality to them and one can discover something new each time they are viewed. Her color palette is probably one of the most sophisticated I have ever seen and she uses it beautifully in conjunction with her amazing compositions. 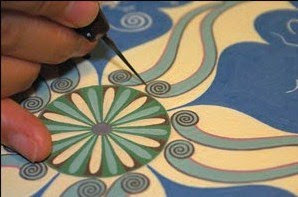 below is a close up of her painting the surface of her work. She is a true Tour de Force. Now, let's take a close look! I really like her use of animal shapes which enhance the function of the vessel. Above, the animals in the vessel provide a repetitive textural edge to the surface. Look at the marvelous beetles that surround the bird, this is a wonderful composition. This is a teapot. Mariko is also a tea enthusiast. 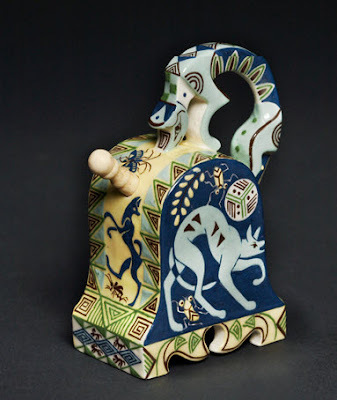 I really love the way the shape of the dog like creature arches his back and accentuates the curve of the pot. The scroll like work at the base adds such visual interest! 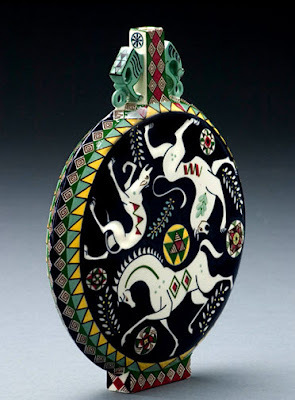 Mariko also makes vases in circular form, the one below is very unusual and I just love the horse! 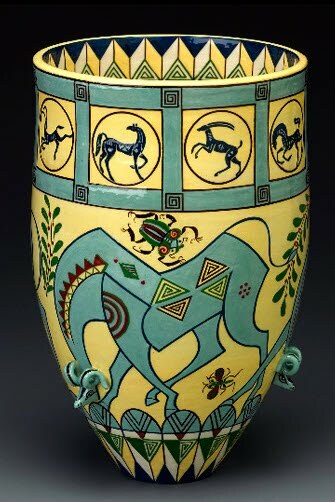 The vessel below is also circular, but in a different way. This would look wonderful on a low table. MARIKO, HOW WOULD YOU DESCRIBE YOUR STYLE? "My style is based on tradition and broad cross currents of culture and history. While I make specific forms that interest me, it is the complexity of the glazing, the contrasts of the geometric and organic (quality) of my imagery that i feel is my "style". I look at both art and design and nature's design constantly. I look, sketch, remember and play with ideas to work with on the 3-d forms I make." WHAT IS YOUR MOST PRIZED POSSESSION ? "My home and my space. " WHAT IS THE ONE THING YOU COULD NOT LIVE WITHOUT?" " Hope...... also, white rice and soy sauce." "I like John Marin's painting, Isamu Noguchi's wood and stone sculpture works, his lighting. Among ceramic artists, Rudy Autio, (one of the artists she studied under). 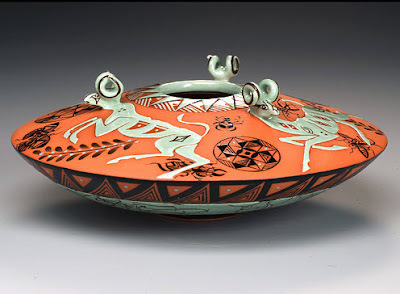 I also like the work of Maria Martinez (pueblo potter 1881-1980)"
IF YOU COULD COLLABORATE WITH AN ARTIST, WHO WOULD IT BE WITH AND WHY?
" I would be interested to work with a sculptor like Akiko Sugiyama, a paper sculptor and friend of mine. I collaborate with my husband Charles (a painter). While our work is unrelated, we both pursue quality of form and design built on the art of the past. A work cannot arise out of thin air. It is sensory experience of the life of an artist, the knowledge, memory that inspiration is built upon." To conclude, I met Mariko and Charles many years ago when I became a patron. I am happy to say that they now live in my hometown of Lancaster, Pa. Mariko continues to exhibit her work nationally. 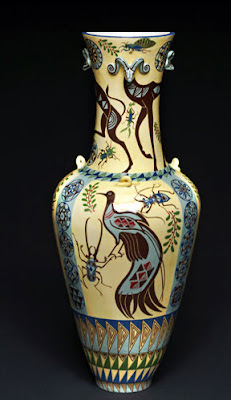 If you are interested in more design features, please check out my blog,www.merlehillaryinteriors.blogspot.com. Beautiful works, very nice spirit of different continents and time, beside nice forms and academic drawings i love the way peaces were glazed. such a great harmony is in your works!